Giveaway! Erin Pelicano Sterling Silver Happy Birthday Necklace! This post has been graciously sponsored by Erin Pelicano. All opinions are my own. I only recommend products or services I use personally and believe will be good for my readers. 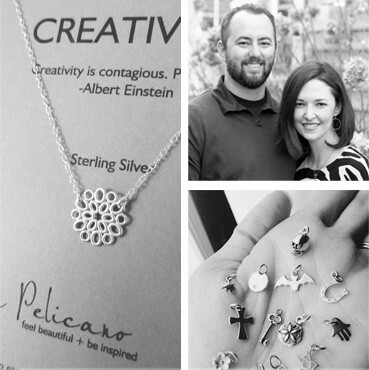 Pam and I are SO honored that we were chosen to be brand ambassadors for Erin Pelicano’s artisan jewelry! Her handmade, designed pieces are simple and sophisticated, and offer a beautiful selection to choose that perfect meaningful, personal piece! First, a little about Erin Pelicano, who just so happens to live in Frederick County, Maryland! “Following a creative heart. After a decade in her career field of engineering, Erin turned her dream of a brand that connects people, into a growing business. Her first pieces, made for friends and family, became treasured gifts. In a single emotional year, Erin lost her brother tragically, and celebrated the birth of her first child. The deep need to commemorate the connection with those we love, Erin’s designs are inspired by her life and love. Erin and her husband, Richard now run the business together with their three young children. One of the many things that we LOVE about Erin’s jewelry is that it is handmade in the USA! Another fun fact – Erin had the opportunity to add one of her pieces to each of 100 Emmy celebrity gift bags this year! 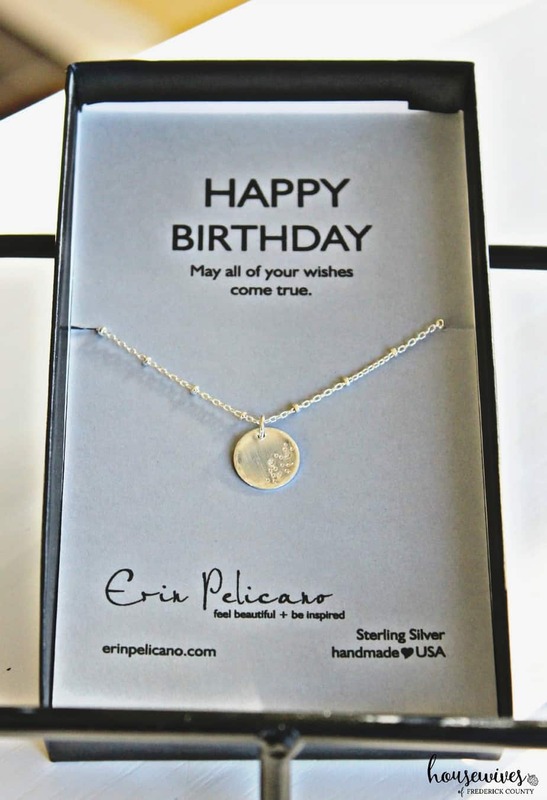 A beautiful Erin Pelicano sterling silver “Happy Birthday” Necklace! This is valued at $ 59.00. From Erin’s website, “A beautiful piece to celebrate Birthdays! This handcrafted necklace makes a meaningful gift for all of the special people in your life. Or wear it yourself as a daily reminder of your of your own wishes. 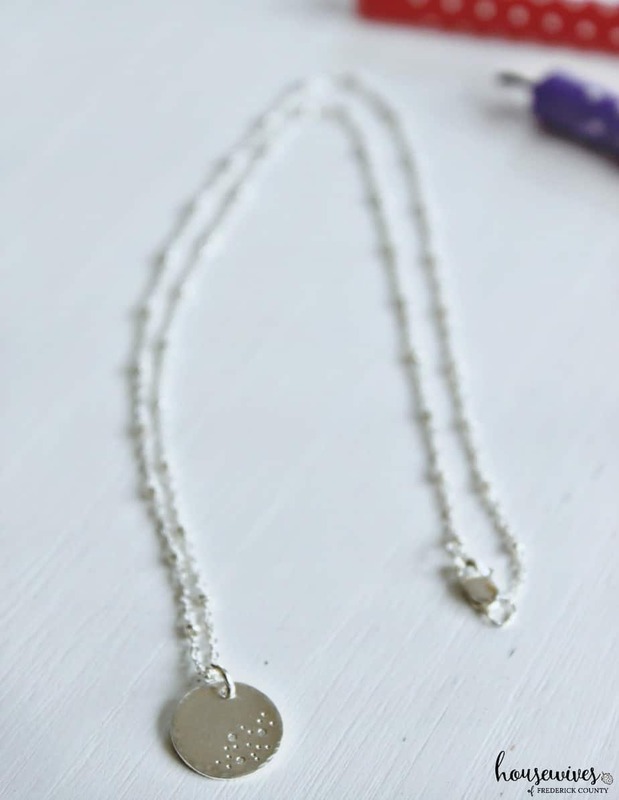 The 12mm hand created pendant hangs on a sterling silver beaded chain, and is boxed with a Happy Birthday card that reads, “May all of your wishes come true.” The sterling silver chain is 18” long. Your odds of winning are based on your number of entries. So, take advantage of all of the different ways to enter! The entries will start on Monday, October 19, 2015 and will end Monday, November 2, 2015 at 12 pm EST. The winner will be announced on Monday, November 2, 2015 after 12pm EST (after the winner is notified). Click on the below Rafflecopter link to ENTER! You have the option to submit up to 5 entries per person through Rafflecopter. The winner will be randomly chosen. 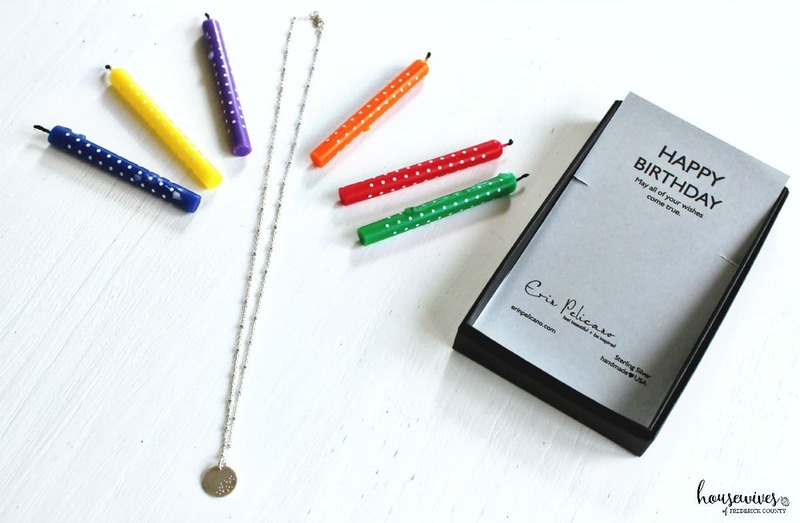 How will the winner claim their Erin Pelicano “Happy Birthday” Necklace? Once we hear back from the winner and that person has accepted the prize, we will ship the necklace to that person. How long does the winner have to claim their prize? The winner will has 48 hours to respond (until Wednesday, November 4, 2015 at 12pm EST) and confirm that they can accept their prize. If we do not receive a response from the winner by 11/4/15, the prize will be awarded to another randomly chosen winner. GOOD LUCK! And, check out Erin Pelicano’s site to explore all of the designs and pieces – I, personally, would like one of each please! I know, Melissa, it really is! I want to win it for my Mom because it’s almost her birthday and I know she would absolutely love the necklace! That’s a great reason Kassie! I’d like to win this for my daughter’s 21st birthday in December! It is a beautiful piece. I would like to win in celebration of my little girl turning 1. I’d love to win this cute necklace! I would love to gift this to my daughter — she turns 21 in December. What a lovely keepsake! It really is! Best of luck to you Elizabeth! This would be awesome for my mom! Best of luck to you Laura! Would love this for my birthday coming up in a few weeks!